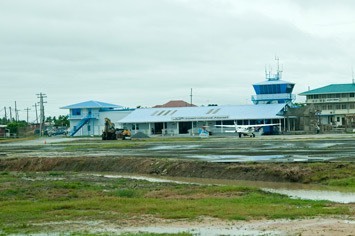 Landing at Ogle Airport, we could see that it had rained heavily, because everything was very wet. 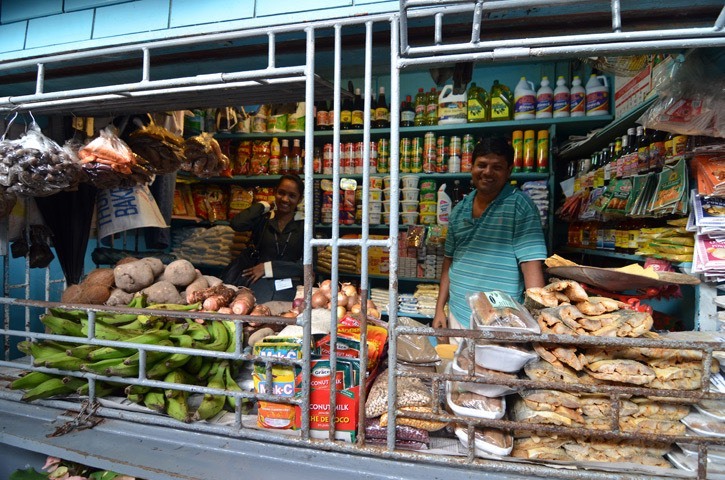 Dennis our faithful driver picked us up again, telling us that, due to all the rain, we might not be able to do all parts of our planned city tour. 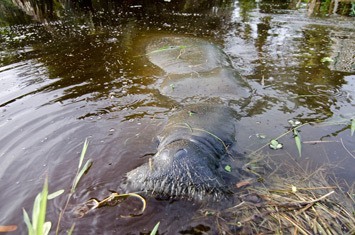 The reason for that was obvious when he drove us to a cash machine in the city and we saw totally flooded streets. 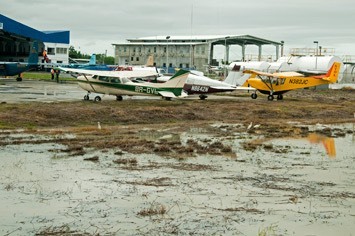 As the plane had arrived rather behind schedule, we only got back to Georgetown in time for a late lunch at Cara Lodge, our home from home. 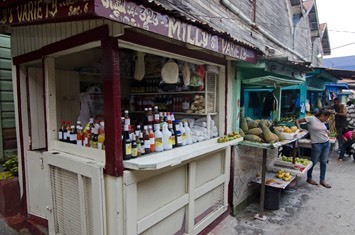 In a way we didn’t feel like setting straight off for our city tour, but it was the only half-day we had available to do it, so we decided to go for it, but only include the places most interesting to us. 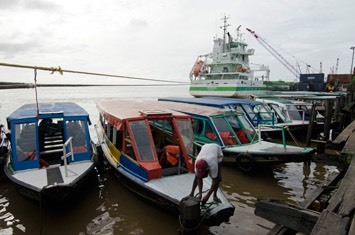 So, right after finishing lunch, we set off, with Dennis at the wheel and Luke Johnson as our guide. 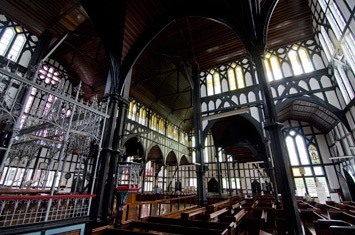 Luke took us by surprise, as he turned up rather formally dressed in black trousers, pale shirt and tie, but it turned out that he had very good connections and was an excellent guide. 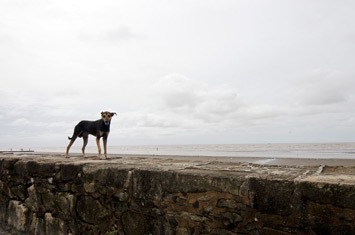 We first drove along the Sea Wall, where we came across a dog who had literally organised himself a doggie bag. 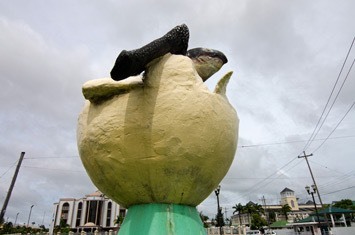 Then, in the centre of a roundabout, we found ourselves confronted by a statue of a leatherback turtle hatching out of its egg, which obviously we had to photograph! 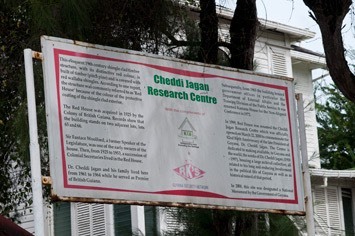 On we went past the American Embassy and the so-called Red House, where the late president Dr. Cheddi Jagan lived while he was in power and which is now a sort of museum. 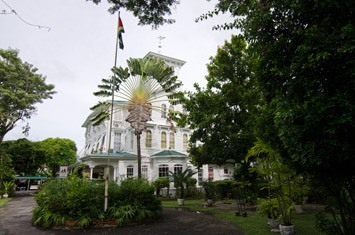 After crossing some of the ditches built to drain the city, we stopped at the prime minister's official residence, which was a very smart building with giant fan-palm trees in the front garden. 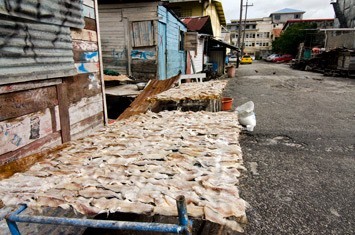 From there we went through some of the poorer parts of town, where Mick jumped out of the car to take some photos of fish spread out to dry in the sun. 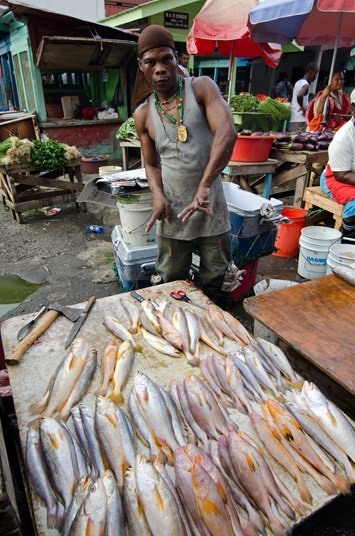 Dennis was worried by the idea of Mick getting out of the car there, but Luke had a word with the people drying the fish and, after a friendly exchange of greetings, taking photos wasn’t a problem. 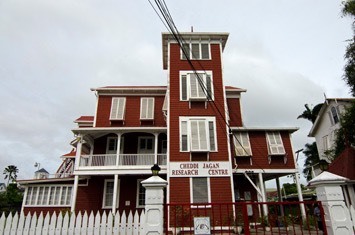 The first stop where we actually left the car was St. George’s Cathedral, which was built in the late 19th century. 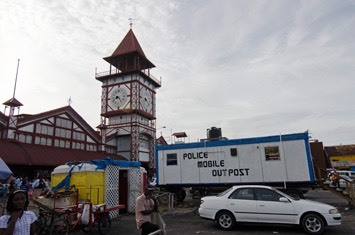 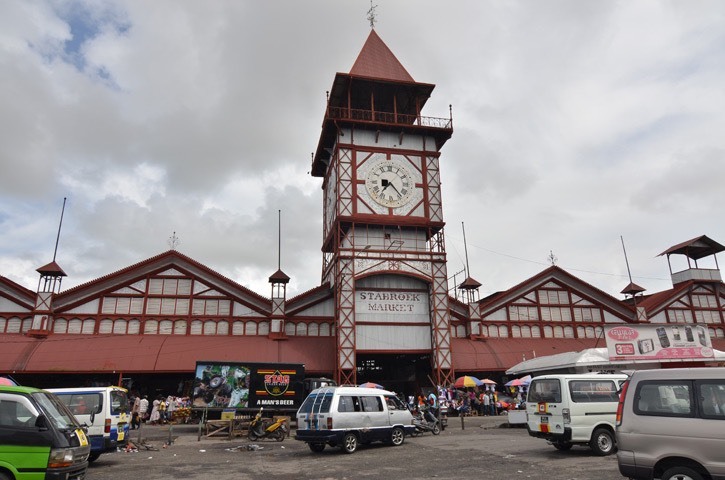 It is an imposing white, cross-shaped building, which vies with the cathedral of Paramaribo for the title of the largest wooden building in the world. 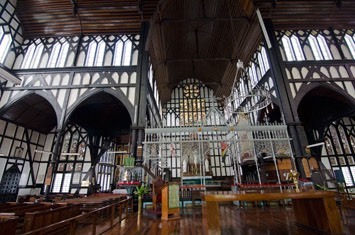 According to Luke there is a technical difference in how they were built, so each building is actually the tallest wooden building in their respective “category”. 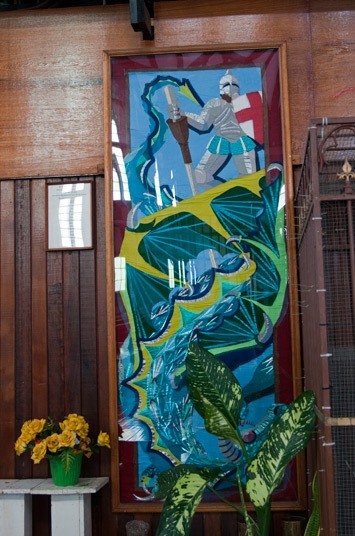 At first it appeared that we wouldn’t be able to get inside, as all the doors were closed, but Luke managed to find somebody who opened the church for us. 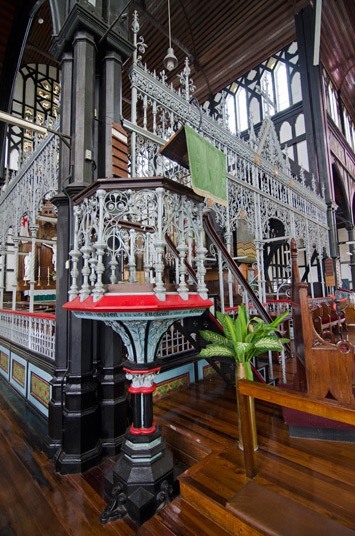 The interior was half timbered and much more colourful than the plain wooden interior of the cathedral in Paramaribo. 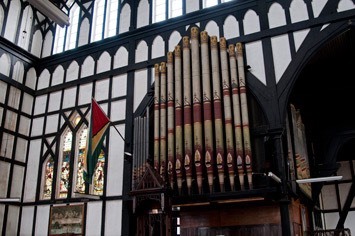 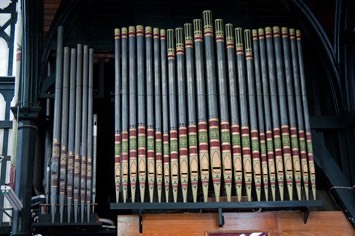 Even the organ pipes were painted in a colourful South American pattern! 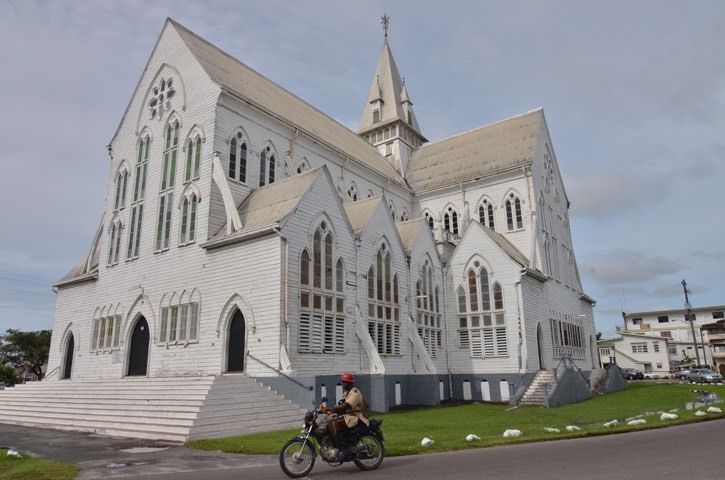 We eventually came to the conclusion that we preferred the outside of St. George’s to the cathedral in Paramaribo, but the plain wooden interior of the latter! 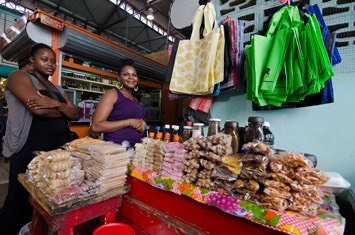 After a short stop at some shops selling souvenirs, we went on to the famous Stabroek Market. 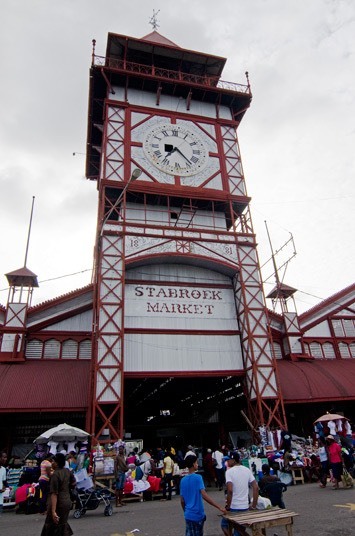 We were welcomed by its famous clock tower and a huge, bustling crowd of people. 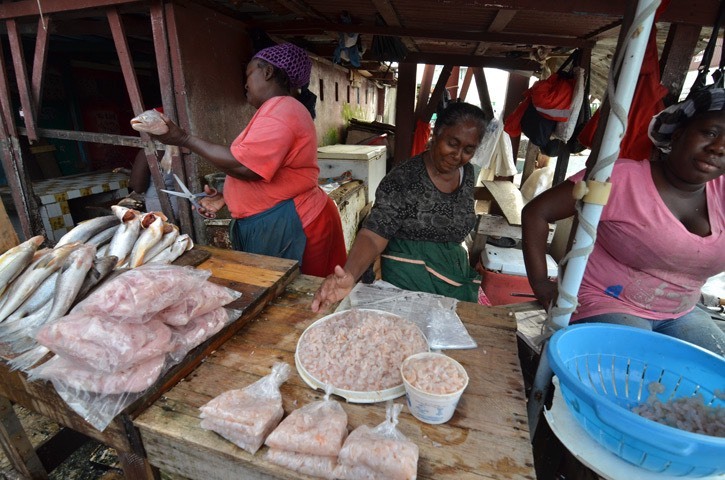 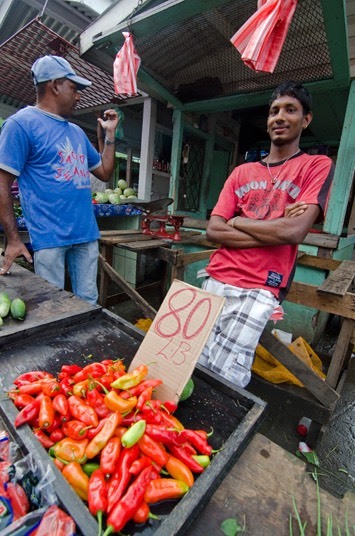 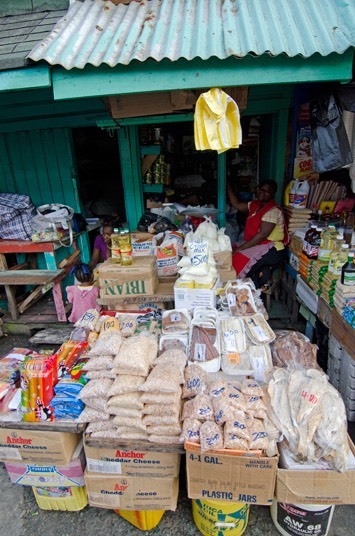 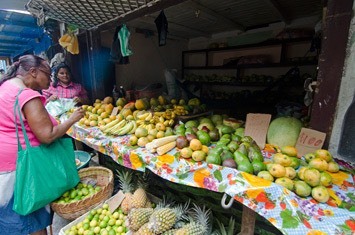 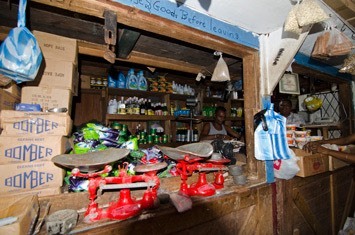 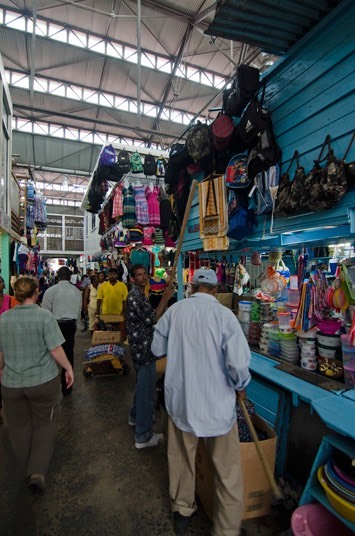 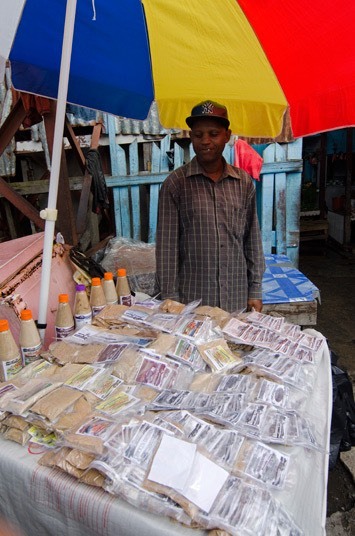 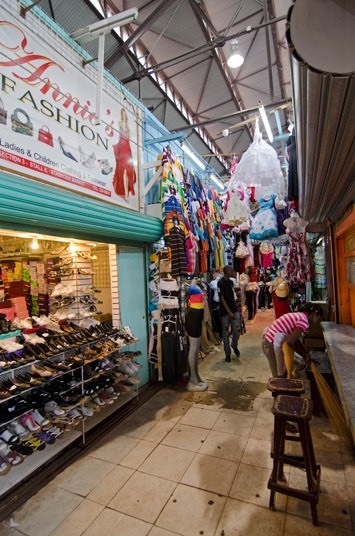 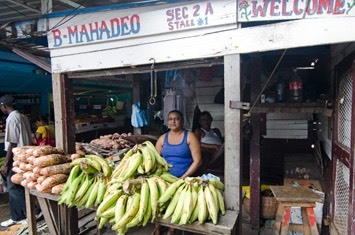 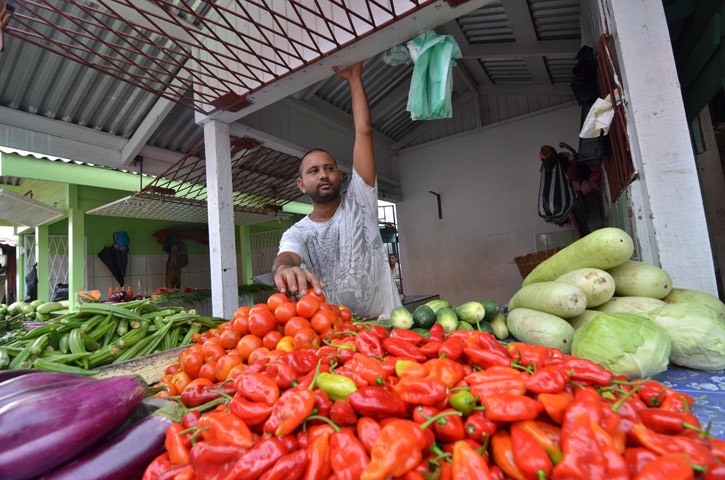 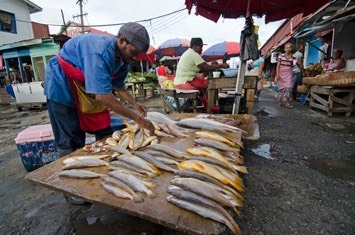 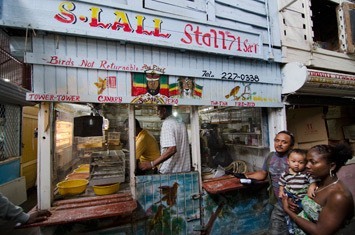 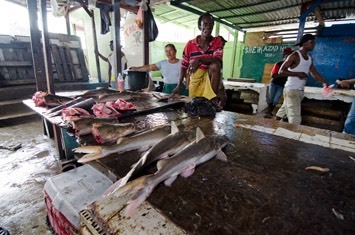 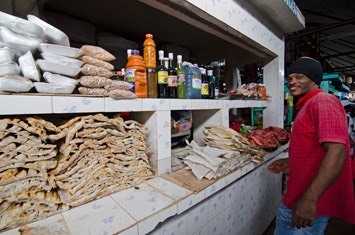 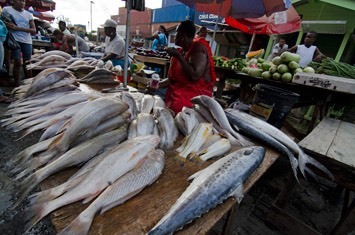 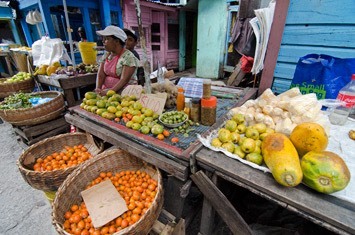 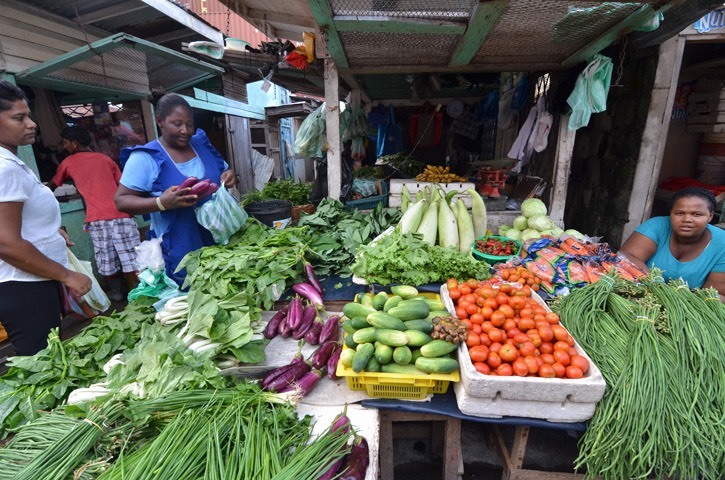 The Stabroek Market is known as the “bizarre bazaar” as one can buy nearly anything there. 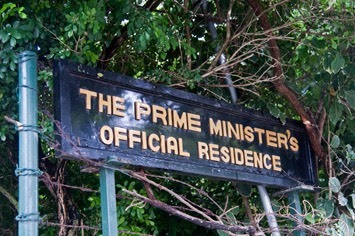 In former times that even included slaves! 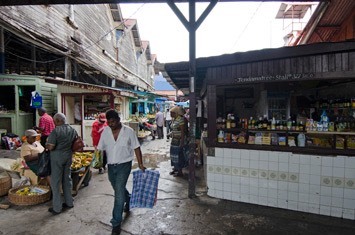 We set off to explore the market, which is partly built over the Demerara River. 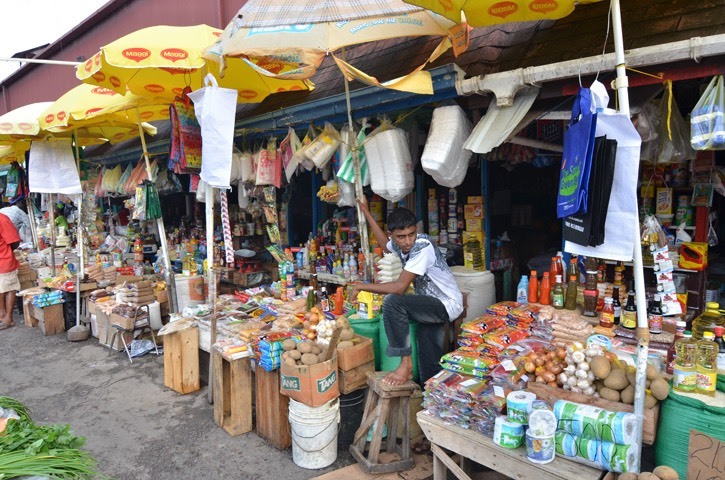 It’s a huge building and inside one can buy clothes, shoes, bags, jewellery, dry food, spices and much, much more. 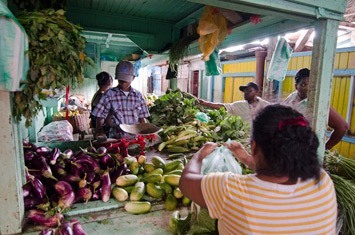 In an outdoor area of the market we threaded our way past dozens of stalls selling fruit, vegetables, meat and large amounts of fresh fish. 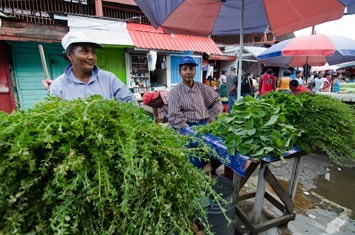 The market traders all seemed to be exceptionally charismatic folk. 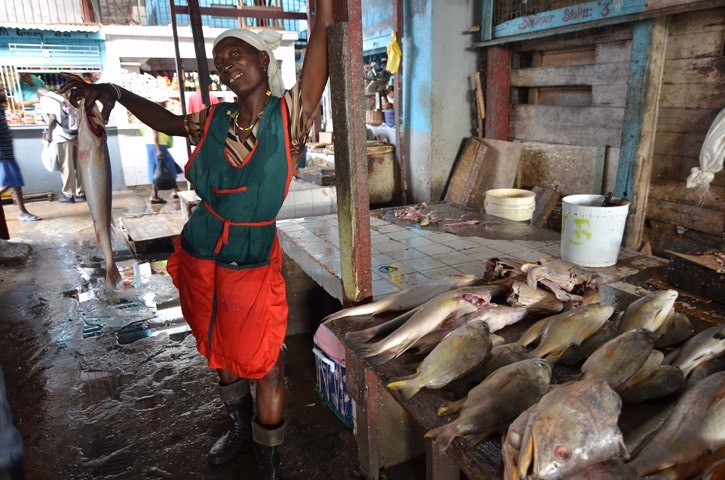 Taking photographs of people was surprisingly easy, as most of them were more than happy to pose for our cameras, and there were only a very few who were camera shy. 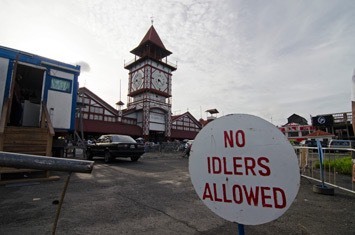 On one occasion Mick was told that, as long as he “aksed” kindly, it wouldn’t be a problem! 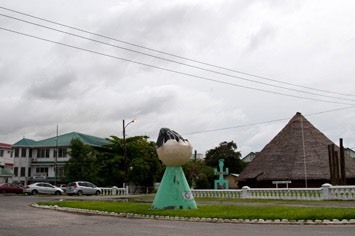 Luke told us later that they were encouraging the locals to be open to tourists, as it would help them all in promoting Guyana as a friendly travel destination. 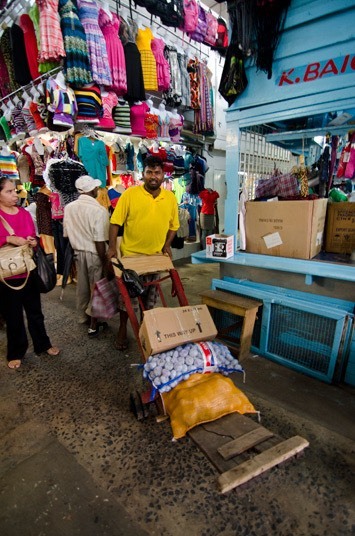 In the streets of Georgetown (and also in Paramaribo) we often spotted men carrying small birds in cages. 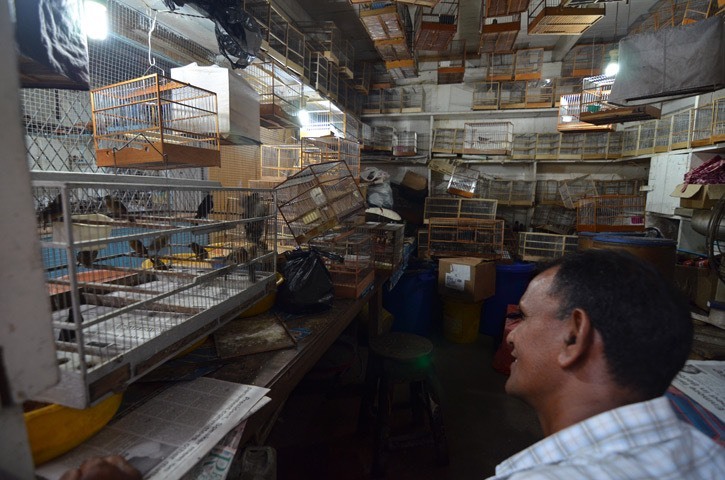 We were told that people “race” these birds every Saturday, meaning they compete against each other according to which bird can sing longer and better. 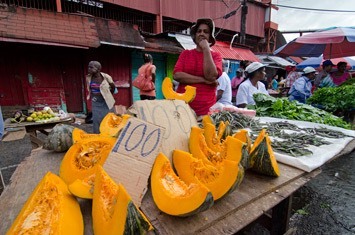 The winners of these competitions can be worth over 1,000 US Dollars! 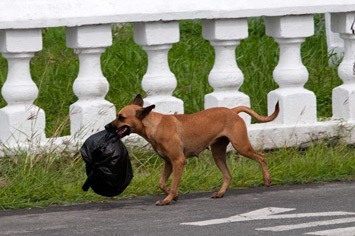 That’s why the owners apparently treat their birds better than their wives and take them wherever they go. 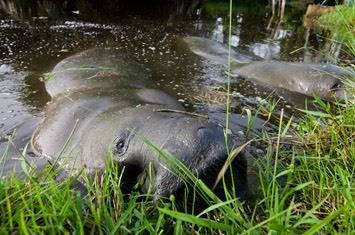 We even went on the plane with one of them! 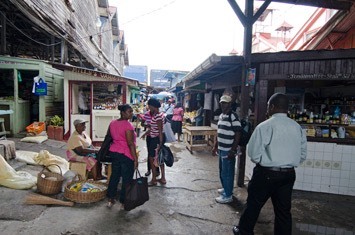 Anyway, Stabroek Market is the place to buy your bird, its cage and its food. 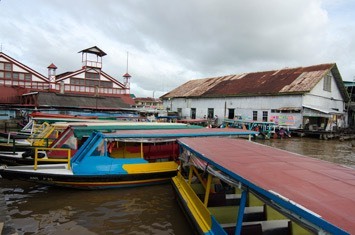 The market is also the hub for mini-buses and water taxis, transporting people and their goods to and from the market and the surrounding villages. 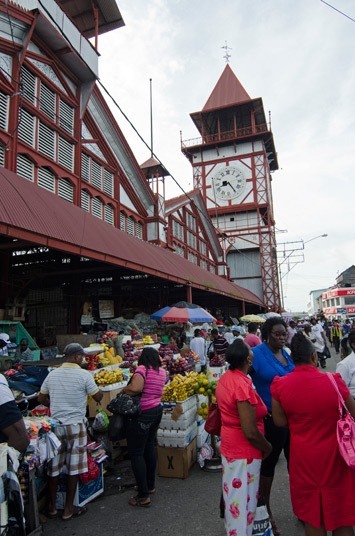 After the hustle and bustle of the Stabroek Market, which left us with an overload of colourful impressions, and the long day we had already had we felt that it was time to come to the end of our city tour. 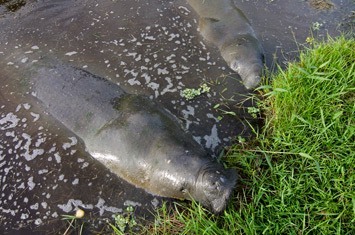 But there was one thing left to check out, which was the Botanical Gardens, where several manatees are kept in a large system of ponds. 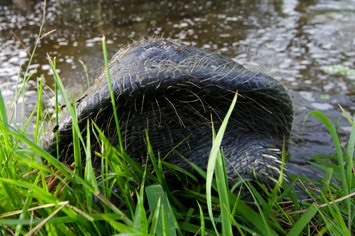 Given the heavy rain from earlier, it wasn’t an easy task, and some parts of the Botanical Gardens were very wet and soggy. 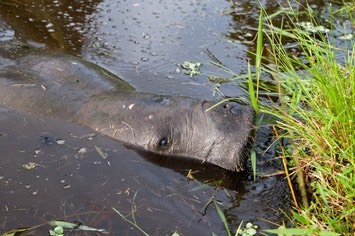 However, after a short walk, Maren managed to spot the first manatee leaning out of the water and feeding on a bush overhanging the small waterway. 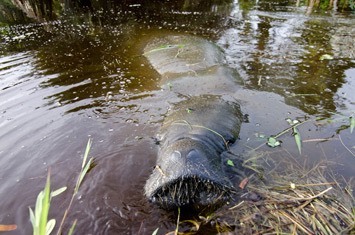 When we got there, it had already disappeared, but only a couple of hundred metres further away, Luke spotted two more manatees. 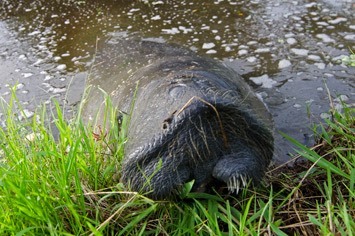 We were very surprised when he ripped up some grass and started waving it in the faces of the manatees. 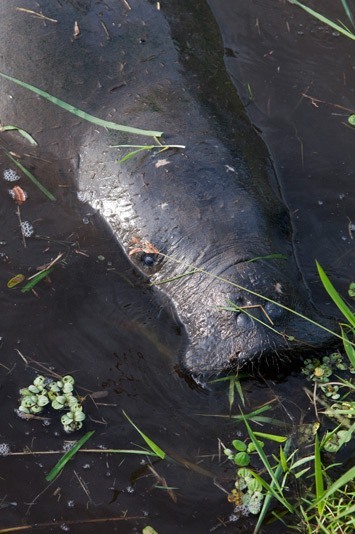 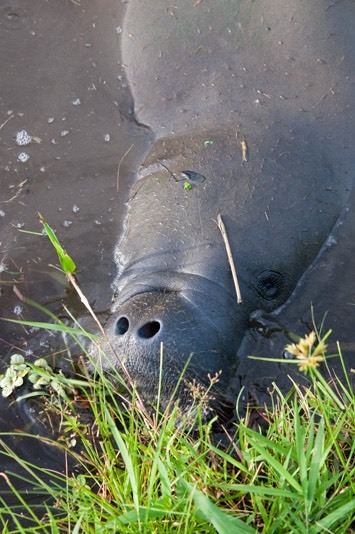 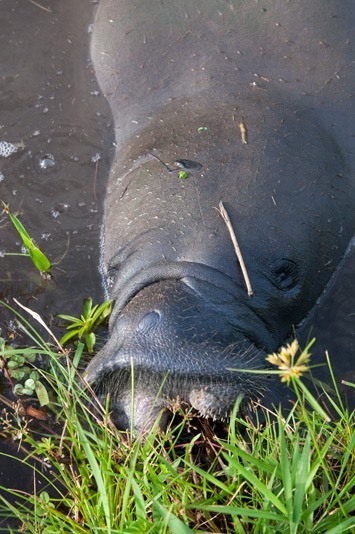 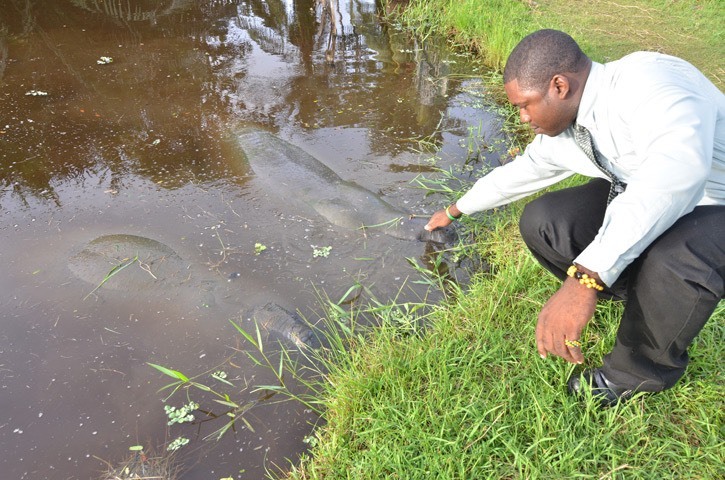 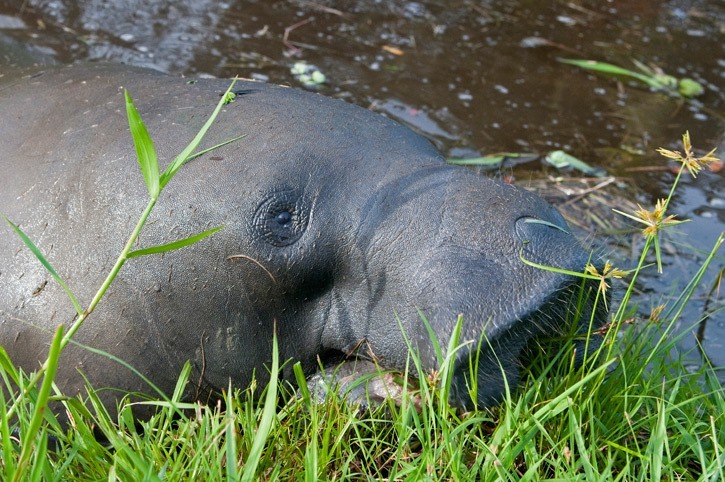 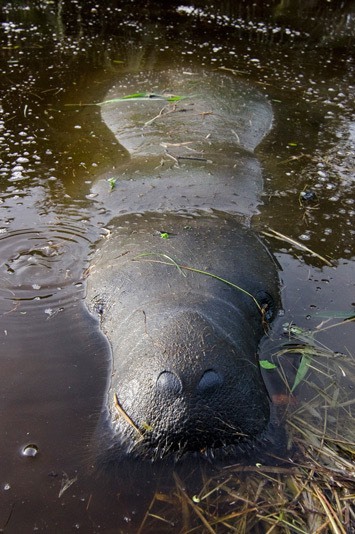 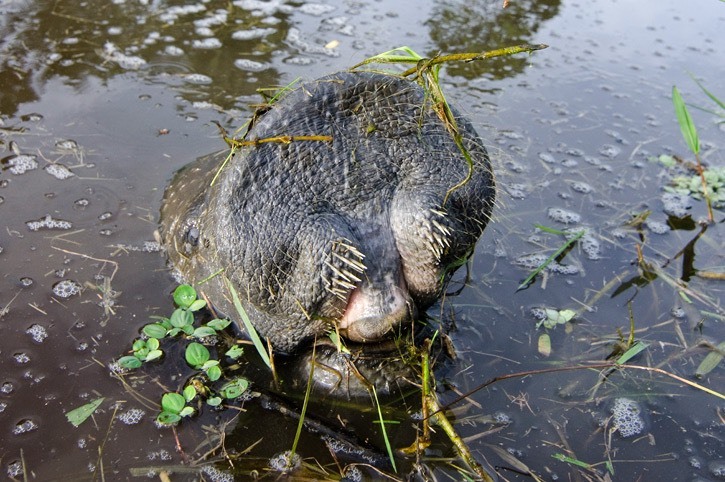 But it really worked – in Georgetown you can feed the manatees with grass! 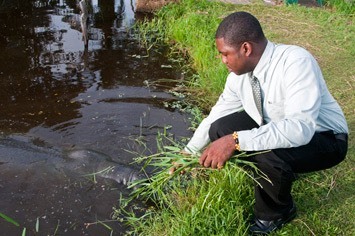 It was quite funny sight seeing Luke in his smart clothes feeding these strange looking animals. 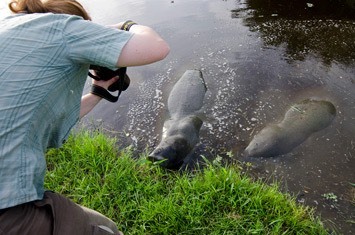 It was the first time that we had actually seen a manatee, so we were quite impressed by their strange shape, with heads like sawn-off seals. 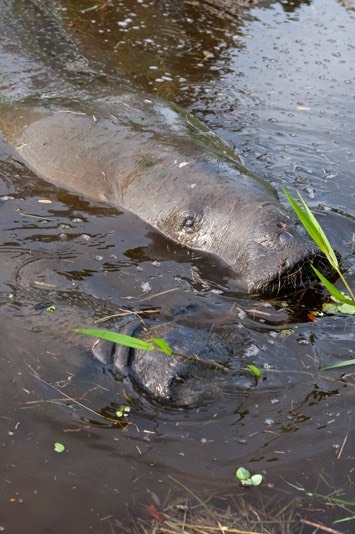 When we didn’t give them enough grass to eat, the two manatees started ripping off more vegetation from the side of the lake, showing us their strange mouths surrounded by a beard of short, stiff whiskers. 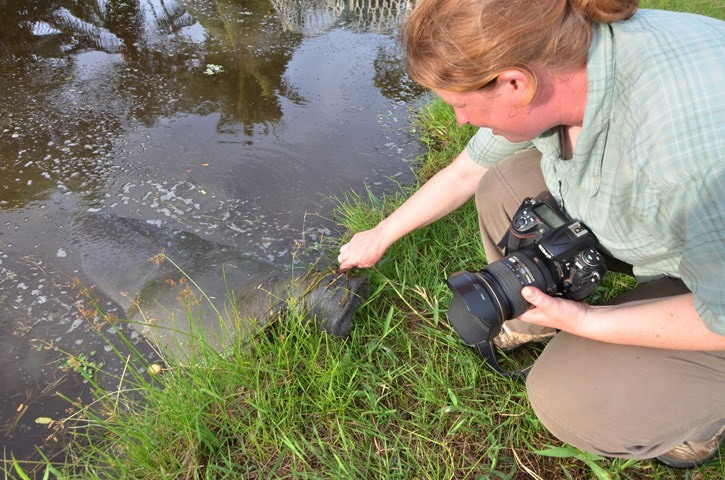 The two manatees hung around for quite some time, so we could all feed them grass and Maren even managed to touch one of the animals! 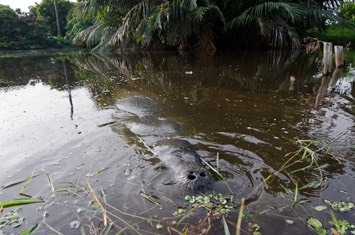 When they had had enough of us, they simply slipped below the surface and disappeared. 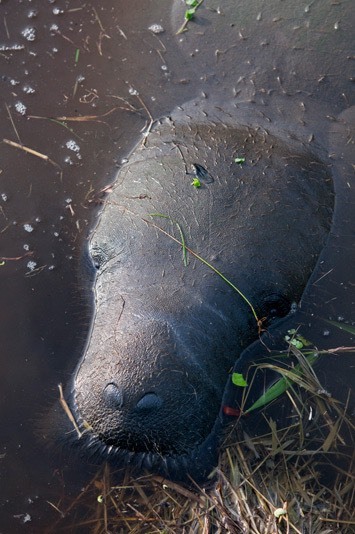 It showed how difficult they are to spot in their natural environment, when they only break the surface with their nostrils, but their smooth backs are hardly ever visible, or only so little of them that it is very difficult to see in anything but the calmest of sea states. 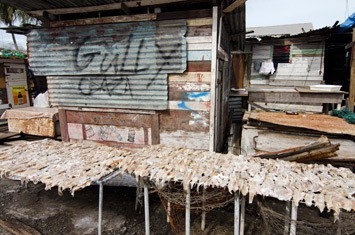 We had a great time on our city tour with Dennis and Luke and we saw a lot. 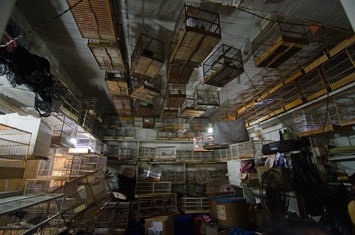 Clearly, there was much more one could see, but that would need several more hours. 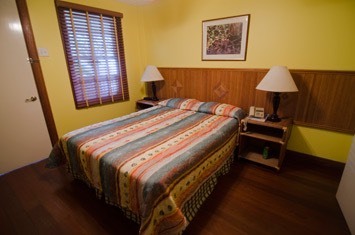 We felt we’d taken in as much as we could in the circumstances and were happy to return to Cara Lodge. 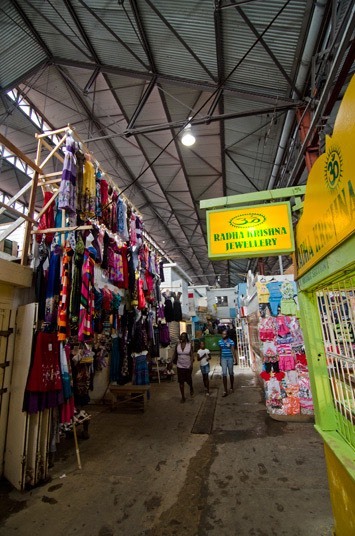 Luke went to do some more shopping, as he would be our guide for the upcoming trip to Kaieteur Falls, while we enjoyed a hot shower and the comfort of Cara Lodge, including a lovely meal in their excellent restaurant. 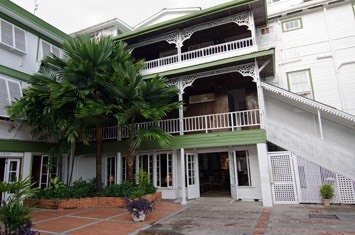 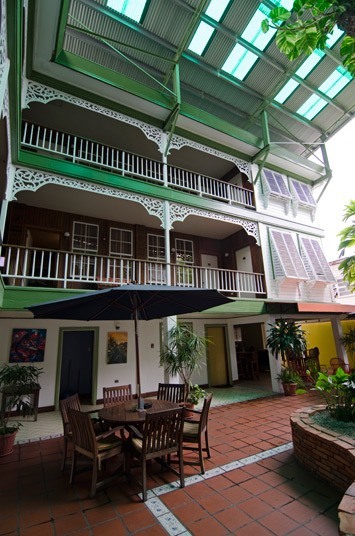 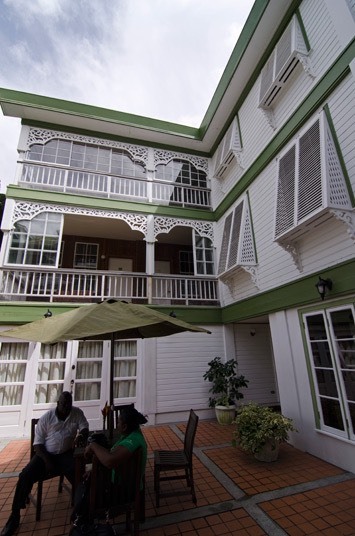 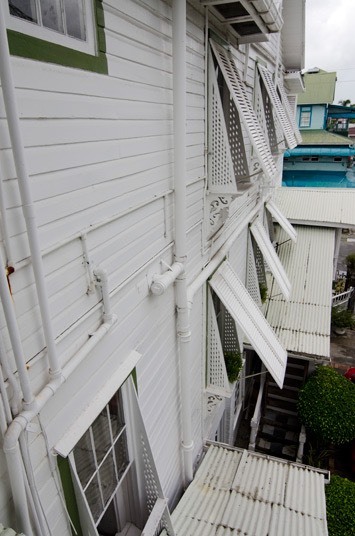 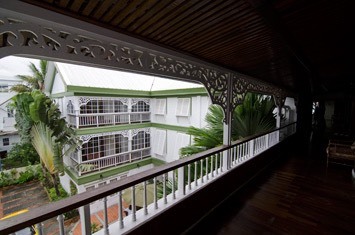 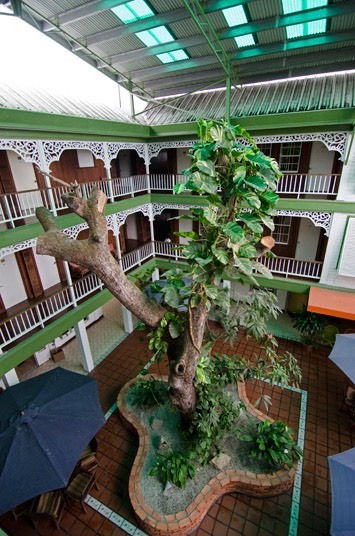 We were extremely pleased to have been booked into Cara Lodge each time we went through Georgetown, as it is a splendid old building that dates from the colonial era and has great character. 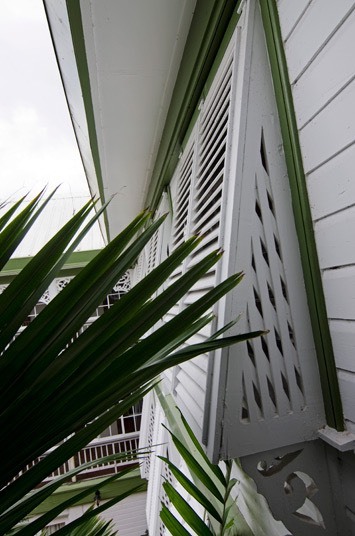 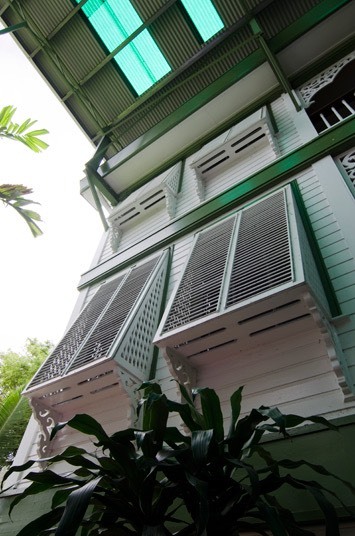 It has a cosy courtyard, old polished wooden floors and the old traditional Demerara shutters. 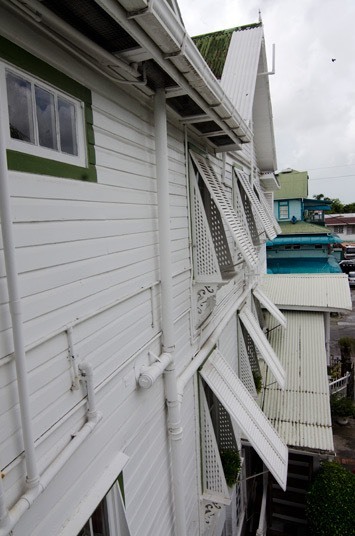 These are extended windowsills, on which big lumps of ice were placed, so that the breeze blowing into the room brought in refreshingly cool air. 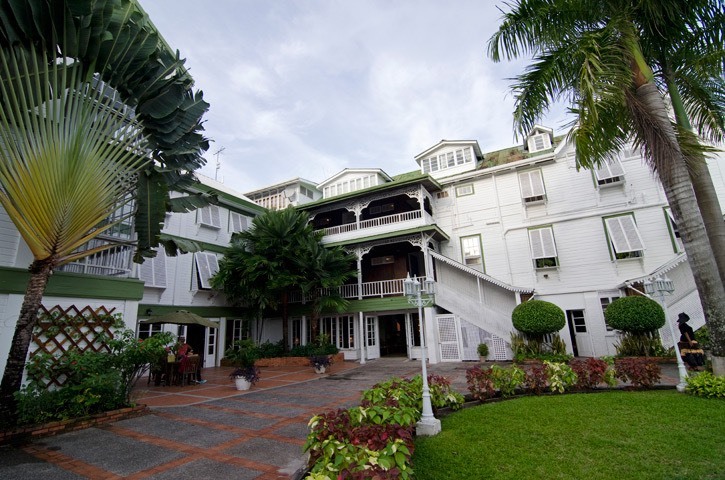 We could see why so many famous people had stayed here before: it just is the place to stay in Georgetown. 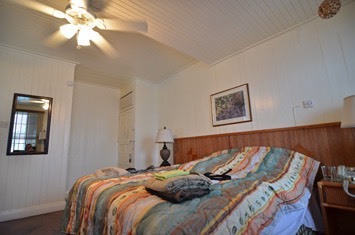 The rooms were very comfortable and had powerful hot showers! 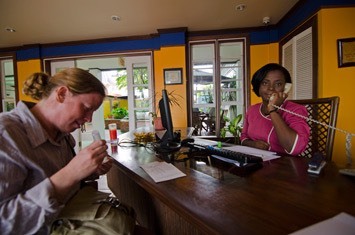 The staff at Cara Lodge were extremely friendly, and by now they already knew us well, bringing us fresh fruit juice as soon as we stepped through the door. 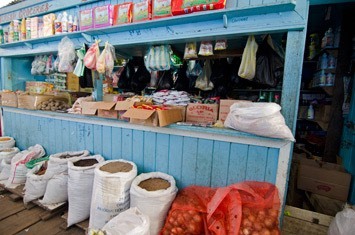 They were also very happy to keep one of our bags for us, while we went off on our trips, so that we didn’t need to take all the clobber we had carried for work on the ship. 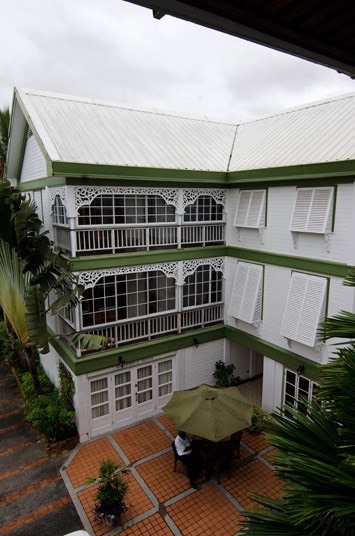 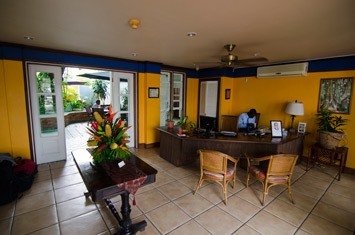 We can certainly recommend the Cara Lodge to anybody looking for a place to stay in Georgetown!